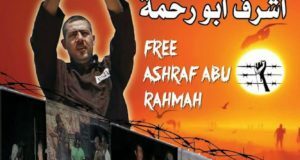 Something is astir in Bilin — mass Palestinian demonstrations based on non-violence and Israeli participation. Sheikh Taysir Al-Tammimi, one of the leading Islamic clerics in the West Bank, gently pulls away the barbed wire that has been laid before him. He then spreads out his prayer mat, facing Mecca. A hundred or so Palestinians cross the imaginary line that once demarcated the coiled border and kneel behind him. Fifty Israeli soldiers stand and look. As the prayer ends, two hundred people quietly applaud, some of them foreign activists from the International Solidarity Movement (ISM), most of them Israeli Jews, from different parts of the Israeli peace camp. It is an act of non-violent protest of almost Gandhian simplicity. For the moment, it works. Israel’s military phalanx, its iron wall, is rendered politically and morally mute. We are in Bilin, a minuscule Palestinian village two and a half miles east of the Green Line. Before the demonstrators — behind the Israeli soldiers — is a scar of freshly razed white earth, the preliminary ruptures for the next section of the West Bank wall. Behind that is the vast, sprawling settlement metropolis of Modin Illit, which the wall “defends” by devouring 600 of Bilin’s 1,000 acres of land. Since February, Bilin’s 1,600 residents have mounted 50 demonstrations against the wall. Two principles govern them. One is non- violence. 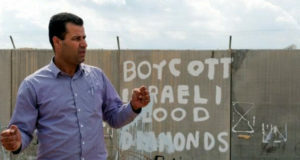 One day they chain themselves to olive trees, demonstrating that the wall not only steals their land but their lifeblood. Another day they give out letters to the troops, explaining in Hebrew that the struggle is “not against Israel as a state but against Israel as an occupation”. This week they are commemorating the first anniversary of the International Court of Justice’s (ICJ) ruling on the wall: that it and the settlements it “effectively annexes” are illegal under every tenet of international law and must be dismantled. A mock up “scales of injustice” has been erected on the back of a truck. On one weight, the lesser one, hangs the world; on the other, the heavier, hangs Israel. Uncle Sam holds the balance. It tells much of what you need to know about the dynamics of the Israeli-Palestinian conflict. The army has not responded in kind. Since the protests began over 100 Palestinians, Israelis and other have been injured from teargas, beatings, rubber coated steel bullets and live ammunition. Dozens have been arrested, including, in June, two of Bilin’s brothers, Abdullah and Rateb Abu Rahme, allegedly for throwing stones. An Israeli military judge dismissed the charge after the army’s own videotapes showed it to be spurious. The prayers too were eventually dispersed in an explosion of tear gas and rubber bullets, leaving 14 injured, four arrested and an ambulance struck by gunfire. But the iron fist has not quelled the protests. On the contrary, they have grown — which brings us to the second principle. All of the demonstrations have been joint actions by Palestinians and Israelis, backed by the ISM. They march together, plan together, organise together and in some cases live together, with Israelis maintaining a vigil in the village to monitor the army’s arrest raids, which usually come the night after the demonstrations. 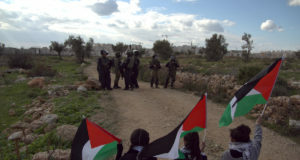 Together with like demonstrations in the neighbouring villages of Budrus and Biddu, Bilin represents the most concerted joint Palestinian-Israeli protest since the Intifada began and consigned the two peoples to their ghettos: ideological in the case of the Israelis, physical in the case of the Palestinians. This is as significant as the ICJ ruling and the non-violence, says Israeli peace activist, Adam Keller. “In many ways the wall is a physical manifestation of what has happened to the two peoples ideologically. The demonstrations in Bilin and elsewhere challenge this segregation. By joining the struggle here Israelis are signalling they want to integrate, not only with the Palestinians, but with the region — which is the ultimate precondition for peace,” he says. No one would argue (least of all Keller) that the Israelis who come to Bilin are representative of Israeli opinion. They are its radical fringes. But as a veteran of the protests of the Lebanese and the first Intifada he knows that what was once deemed heretical can become the heritage. “We know these demonstrations won’t become mainstream today, but they can become the catalyst for the mainstream in the future,” says Shaul Moghrabi-Bergen from Anarchists Against the Wall, the most active Israeli group in Bilin. Is a similar catalyst being formed on the Palestinian side, beyond the confines of Bilin, Budrus and Biddu? The first row of worshippers behind Al-Tammimi comprised representatives from all the PLO factions, including (like Keller) veterans from the Lebanese war and first Intifada. But they were joined by delegations from Hamas and Islamic Jihad. The chance is based on two considerations. The first is the only road from ICJ ruling to enforcement is through international public opinion, including, critically, Israeli opinion. It is only when the Israeli peace camp as a whole supports the Palestinian struggle on the bases of international law that it will shed its implicitly racist notions of demographic separation in favour of a genuinely anti-colonial sentiment. The second is that critical breach in Israeli opinion is more likely to be wrought through non-violent struggle than violent and uncoordinated resistance. “When we demonstrate non-violently the world at least is with us. When we resist violently, it isn’t,” says Bilin resident Samir Banar, beneath the skewed scales of injustice.